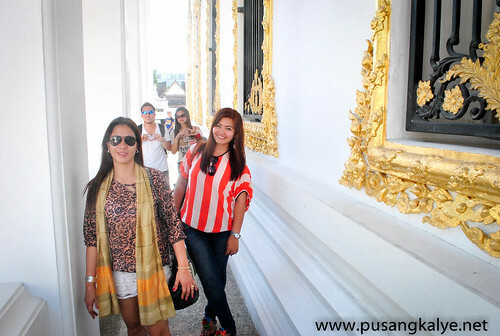 Indecisive moments.After Wat Pho, my friends asked me "What Po ang susunod?" 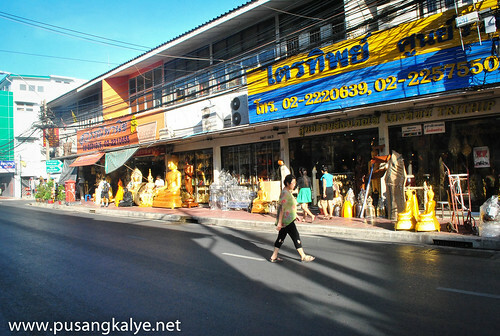 I didn't know.My planning ended when we left Siem Reap as I wanted our Bangkok tour to be more spontaneous. 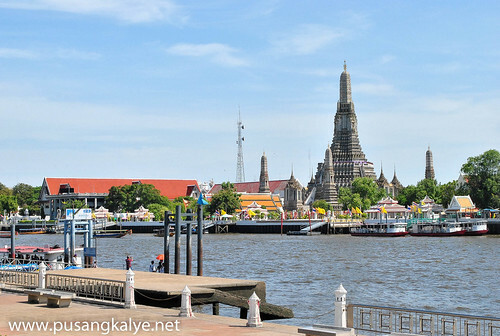 We walked to a park near the river where the imposing structure of Wat Arun could be seen.That's actually the original plan---to cross for Wat Arun but it was still a bit early so we tried something else before going back to the same spot in time for a nice sunset view. This calls for a slowdown.There was nothing else in the itinerary except for dinner with a former classmate in High School already working in BKK, so we wanted to relax a bit.The smell of food on stick lured my friends again as there are many street vendors at the park. 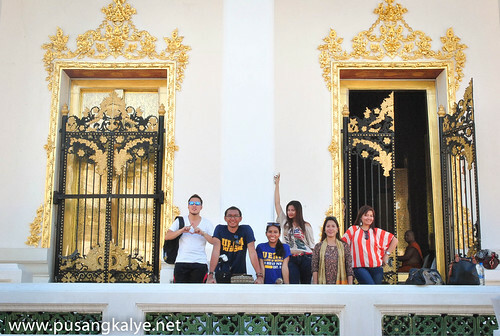 We were with the Filipino couple from UE by that time and they were also free flowing with their itinerary so they asked for a few directions with a guy who looks rather trustworthy.After a few exchanges, the guy was able to convince the pair to try somewhere less touristy. in the area where they originally wanted to go.Actually, the initial plan was to go to a place famous for cheap jewelries, sorry I can't recall the name of the place since they are hard to remember. To cut the long story short, we agreed to go with them. The guy we talked to immediately contacted tuktuk drivers to bring us there.A lot of negotiations happened on the price of the ride took place before we set off. Before entering the temple, we went for a late lunch.There are a few restaurants nearby similar to our carinderyas in Manila.We went for noodles.I don't even know the name coz communicating in English to the owner is difficult.I notice some genuine hospitality here though.The owner offered water to us even before we asked for it. WAT THEPTHIDARAM WORAWIHAN is a small temple.I heard that it is not officially open to the public yet coz they are still in their final touches to get ready for the flood of tourists.There's nothing very grand about the place but since we were the only visitors at that time, we were able to take our time and enjoy looking around. 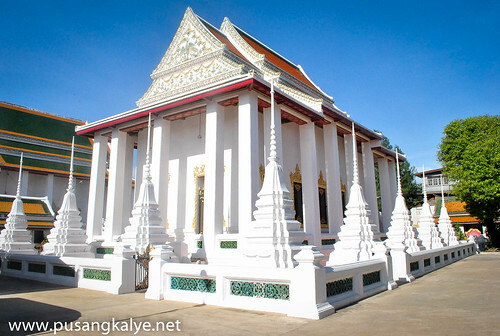 The temple has a lot of artifacts with beautiful patterns,porcelain and Chinese dolls as evidence of rich trading between China and Thailand. 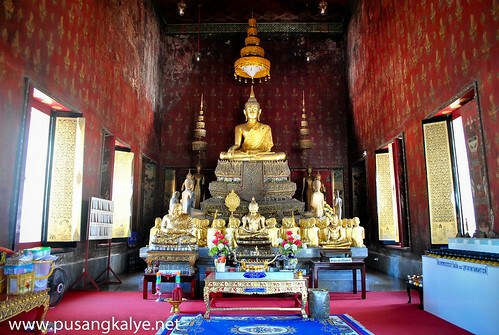 In the main hall is the principal Buddha image which was carved from pure white stone.King Rama III gave the name Phra Phutthathewawilat to the Buddha image in 1971.Even the roof of the temple is decorated with Chinese porcelain. 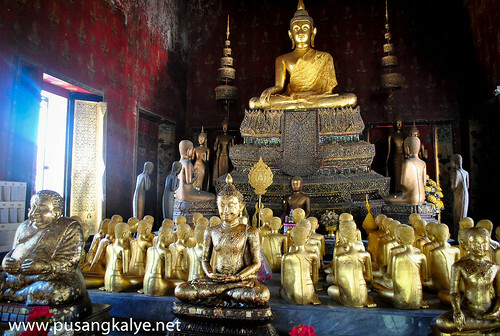 Did you know, the altar of Wat Thepthidaram features 52 statues of female Buddhist monks? I didn't notice that at first as they were facing the main Buddha Statue. 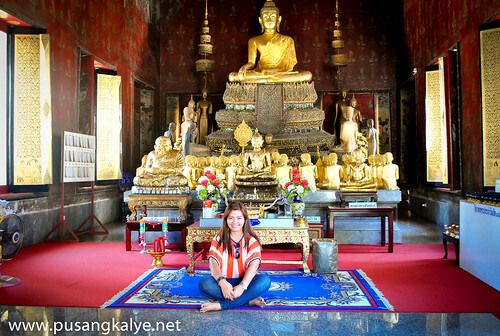 In fact, this is the only place in Bangkok where you can find female monks ---albeit they are only statues.Cool! Photography is not usually allowed inside temples but we were granted to take photos inside by the monk inside.I guess they really wanna promote the place.No entrance fee is collected but you can donate money if you want.We gave a few Thai notes and that's it. 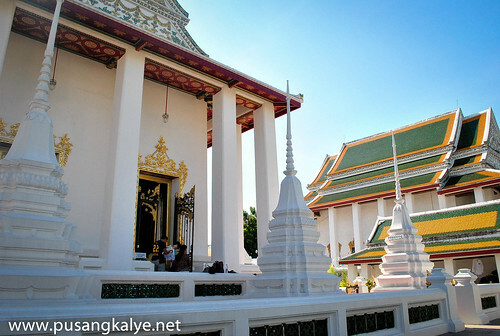 There are other attractions nearby as indicated by our map.But since it was nearing rush hour, it was a bit difficult to haggle with tuktuk drivers so we parted ways with the couple from UE and found our way back to Wat Arun via Wat Po. 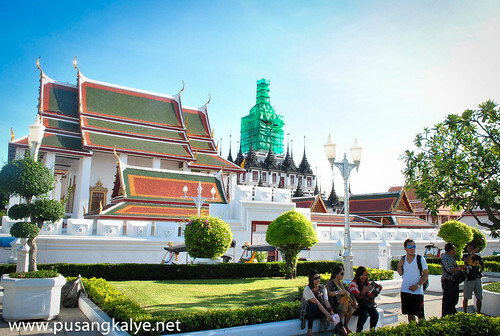 Noticed that there is a bigger, more beautiful temple near Wat Thepthidaram Worawihan but some part of it is still under construction so we didn't bother to enter.We stayed in a small park at the nearby intersection.It was here that I realized that Bangkok is indeed a city of temples.Walk around and you end up in many places like this.Nakaka-proud maging Thai. 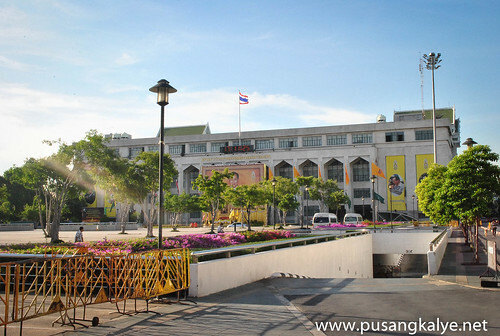 Passed by Bangkok City Hall where we haggled for a tuktuk ride worth 120 Baht to the same park we originated earlier. 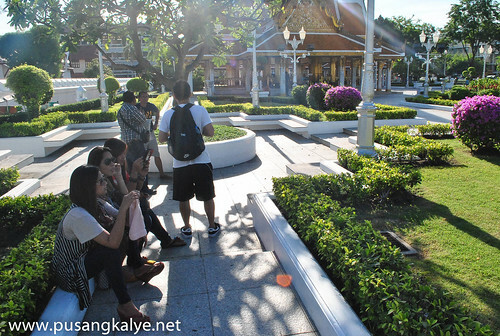 It was still early for sunset when we arrived at the park across the river from Wat Arun.Still had time for a few food-on-stick again.Then we boarded the ferry at Chang station to cross Chao Phrayato the other side where the station is next to Wat Arun itself. Wat Thepthidaram Worawihan was a welcome diversion.It might not be as grand as other temples in Bangkok but it sure is charming.To be able to take your time and enjoy a place on your own in a touristy city like Bangkok is rare.This is a unique temple because it's the only place in Thailand where you can find female monks, although they are only statues.You don't wanna miss that. ...I notice some genuine hospitality here though.The owner offered water to us even before we asked for it... >>> I should mention here that some street food shop might not offer you your drinking but they might have "DIY" drink. I mean you pick up your own glasses and pour the water youself. I don't know how Filipinos would feel but here in Thailand we don't view this as an act of lacking hospitality. If you can help yourself, do it. By helping yourself, you also help the owner since he/she might be busy cooking or doing something that he/she doesn't have time to take care all of his/her customers. 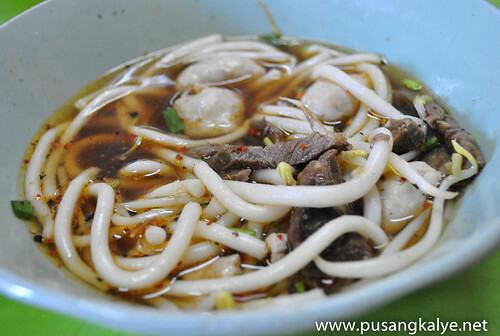 If you want the waiter to serve you drinking every time you enter a food shop, better find some fancy restaurant instead of street food stalls. After looking over a handful of the articles on your website, I honestly like your way of blogging. should also visit this website on regular basis to get updated from newest news update.